Errors in subject-verb agreement is one of the most common writing and speaking errors. 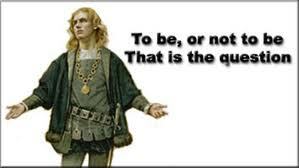 Errors in subject-verb agreement are one of the most common writing and speaking errors. Which sentence is correct, the first or second? If you said the second, you are right. If you said the first, read on. The examples above demonstrate a common error, but one that can be easily remedied. 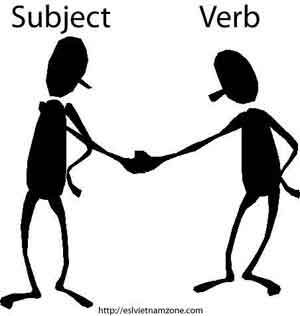 All you have to know is what the subject and verb are in the sentence. In the examples above, “Errors” is the subject and “is” or “are” works as the verb. The second sentence, the correct sentence, uses “are” as the verb, which is plural. Since the noun, “Errors” is plural, they are in agreement. Plural nouns must have plural verbs, just as singular nouns must have singular verbs. Simple? Not always. Use the singular verb form with the subjects she, he, it, anyone, anybody, each, each one, either, neither, everyone, everybody, nobody, somebody, someone, and no one and any singular noun. All other singular verbs are formed by adding an “s” or “es” to the end for the word, such as goes, walks, writes, sees. Use plural verbs when the subject is I, you, we, they, and any plural noun. Adding an “s” or “es” to a noun creates a plural noun but adding “s” or “es” to a present tense verb makes it singular. My grandmother writes beautiful poems. My grandparents live on a farm. We stay with my parents when we travel to Florida. I take classes in the summer so I can travel in the fall. You are lucky the police didn’t check your identification. You believe everything salespeople tell you. He requires students to purchase his memoir. They are not flying to the World Series in St. Louis, but they will drive. She works the night shift at the discount store and he babysits their kids. Subject-verb agreement, in the above examples, seems simple. However, sometimes it’s difficult to determine the identity of a sentence’s subject and if the subject and verb are singular or plural, especially if the subject and verb are separated by a phrase. Ex: The letter was mailed at the post office. Ex: The car swerved in the road to avoid the deer. Ex. One of the windows was left unlocked. Ex. The coach, as well as the players, is nervous. Ex. The book, including the preface, is tedious to read. Under the bed were the missing earrings. There are many reasons for her success. There is one particular reason for her success. The group camps in the city park. The team runs sprints before each game. The family has a unique background. As you can see, subject-verb agreement can be tricky. Knowing how to identify the subject and verb of a sentence is the first step overcoming this common writing mistake. In last week’s post, we discussed the importance of emphasizing important ideas in sentences. This week, we’re focusing on the other essential element in effective sentences: conciseness. Conciseness is simply direct, succinct writing. Get to the point and use the most effective words to construct the most effective sentence. Although concise writing doesn’t always mean to use the fewest words, fewer words generally create tighter writing. Take out the dead weight, meaning, omit any words that are not contributing something important, or are saying the same thing you’ve already said using different words. Take out the dead weight, meaning, omit any words that are not contributing something important, or are saying the same thing you’ve already said using different words. Take out the dead weight, meaning, omit any words that are not contributing something important, and avoid redundancy. Saying the same thing you’ve already said using different words and avoid redundancy mean the same thing. The revised version is more direct, and the message is communicated more clearly. Fewer words = less confusion. It’s also common for writers to refer to a color or size, describing something as “blue in color” or “large in size.” In color and in size are unnecessary, as it’s a given that blue is a color and large is a size, right? Compulsory a Attendance during exam week is required. The basic fundamental reason he won is he raised more money. Empty words contribute no essential information to a sentence. Some of the most common empty words in student essays are definitely, very, really, and literally. The research definitely shows that meditation improves physical and mental health. The paper was very interesting. OR The paper was fascinating. He was literally dying of his own germs. The end result is death if a patient is not treated within twenty-four hours. Because of the fact that NASA has cut funding, our space missions are in jeopardy. Writers sometimes use too many vague words to express a concept when a more precise word would communicate more clearly. Wordy: The governor talked about several of the merits of mandatory recycling in his speech. Specific: The governor touted mandatory recycling in his speech. Vague: The thing was to get as many volunteers as possible. Specific: The objective was to get as many volunteers as possible. As you can see, constructing effective sentences is one sure way of improving your writing immediately. 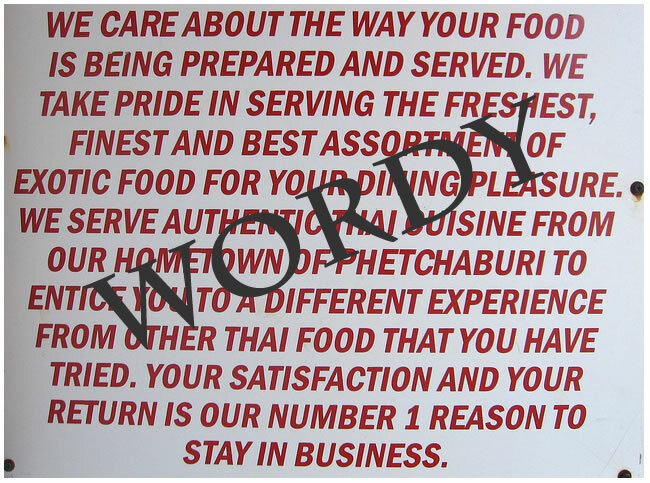 Avoiding redundancy and eliminating wordiness will create clear, concise writing. Edit your sentences, keeping a close eye on each word, and ask yourself if each word is contributing to the meaning of the sentence. Concise writing is not always a matter of using fewer words, but using more effective words as well. 1. One of the major problems that is faced at this point in time is that here is world hunger. 2. At the present time, many different forms of hazing occur, such as various forms of physical abuse and also mental abuse. 3. I would call your attention to the fact that our former President, who was formerly the Governor of Arkansas, is basically a Southerner. (Part II next week: Conciseness) Have you ever read something, and then had to go back and read it again because you couldn’t understand what the writer was trying to communicate? Has an instructor ever written, “confusingly worded” or “reword” on your papers? Ever wonder exactly what makes up an effective sentence? #1: They emphasize ideas clearly. #2: They do so as concisely as possible. If sentences are clear but the arrangement of word order prevents important information from taking center stage, it’s a problem of emphasis. 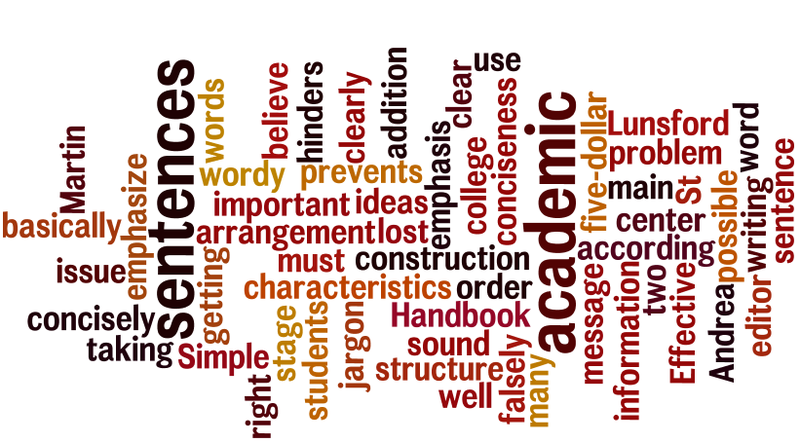 In addition, many college students falsely believe they must use academic jargon and wordy, complicated sentence structure to sound, well, academic. Doing so only hinders the writing, the message getting lost in complicated construction and five-dollar words. This is an issue of conciseness. This week we’ll discuss how to improve emphasis. Effective sentences basically have two main characteristics. I wanted to emphasize the “two main characteristics,” so I placed that phrase at the end position. Slightly less dominant but still a principal position, is the opening of the sentence. The couple gave $100,000 to the zoo fundraising drive last night. What is the most important information in the above sentence? If you said the amount of the donation, $100,000, you’re right. If the final position of the sentence emphasizes the words in that spot, when the donation was given – “last night,” is emphasized, and not the donation, which is significant and important. Let’s rearrange the word order to emphasize the amount, and not the time. Last night, the couple gave the zoo fundraising drive $100,000. In this revised example, the amount is now emphasized, creating a more dramatic structure. When you present ideas in climactic order, the most important ideas or items of a series are in the final position, placing force behind the words for dramatic effect. Kristy’s behavior annoyed her classmates, angered her instructor, and enraged her boyfriend. The protesters risked family rejection, brutal imprisonment, and almost certain death. Saving the most dramatic item for the last position communicates a more powerful message. Video games damage our eyes, destroy our brains, and harm our ears. Video games hurt our ears, damage our eyes, and destroy our brains. Placing “destroy our brains” in the final position creates a greater emotional impact. In your final editing stages, spend time critically thinking about sentence structure. Your writing be more clear and fluid, and pack a more powerful emotional punch. Now you try! Which of the following sentences in each group correctly highlight the most important items in the sentence? At the 1994 Winter Olympics, Nancy Kerrigan went on to receive the silver medal in figure skating despite the preceding media circus. Despite the media circus preceding the 1994 Winter Olympics, Nancy Kerrigan went on to receive the silver medal in figure skating. Nancy Kerrigan went on to receive the silver medal in figure skating at the 1994 Winter Olympics, despite the preceding media circus. The presence of the Indian in these movies always conjures up destructive stereotypes of bloodthirsty war parties, horse theft, and drunkenness. The presence of the Indian in these movies always conjures up destructive stereotypes of drunkenness, horse theft, and bloodthirsty war parties. Destructive stereotypes of bloodthirsty war parties, horse theft, and drunkenness always are conjured up by the presence of the Indian in these movies. Victorian women were warned that if they smoked, they would become sterile, grow a mustache, die young, or contract tuberculosis. Victorian women were warned of the side effects of smoking: they would become sterile, grow a mustache, die young, or contract tuberculosis. Victorian women were warned that smoking would cause them to grow a mustache, contract tuberculosis, become sterile, or die young. A crowd gathered, the stranded whale wriggled off the sandy beach, and a chorus of seagulls cried shrilly. A crowd gathered, a chorus of seagulls cried shrilly, and the stranded whale wriggled off the sandy beach. The stranded whale wriggled off the sandy beach after a crowd had gathered and while a chorus of seagulls cried shrilly. In 1998, Sammy Sosa and Mark McGwire both shattered the old home run record while their respective teams did poorly. Sammy Sosa and Mark McGwire both shattered the old home run record while their respective teams did poorly in 1998. In 1998, while their respective teams did poorly, Sammy Sosa and Mark McGwire both shattered the old home run record.